Uribe says that after losing weight on a high-protein diet he started two years ago, he's down to about 800 pounds. Last year, Uribe left his house for the first time in five years. 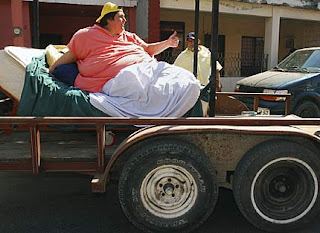 Six people pushed his iron bed on wheels out to the street as a mariachi band played and a crowd gathered to see the man who once weighed 1,235 pounds. At the time, the 42-year-old mechanic rode through the streets of his native San Nicolas de los Garza to enjoy the sun and wave to neighbors. Uribe weighed more than 250 pounds as an adolescent, and he just kept growing. Since the summer of 2002, Uribe has been bedridden, relying on his mother and friends to feed and clean him. He drew worldwide attention when he pleaded for help on national television in January 2006. Uribe says despite the setback, he still hopes to go out with his girlfriend on June 11, when he will turn 43. "We'll just have to plan it better," he said. # Posted at 8:47 PM.